Kanazawa-East, West, Shyu and North | Digitalestate Inc.
“Kanazawa-East, West, Shyu and North” is a work that has been defeated by applying for the 5th Izumi Kyouka Commemorative, Kanazawa Drama Grand Prize. It is a drama that I wrote with confidence as the author. I could not get buried the manuscript, so I decided to publish it as an electronic book. Although it seems that the defeated work had finished with the losing of sleep of the defeat in the past, in order to avoid the risk that the contents of the “unreleased” work will be cross-flowed, I decided to publish it. Ms. Saiko Muroo is an actress and a daughter of Suikin-ro in West-hanamachi (fleshpot) in Kanazawa City. Together with Reika Yoshimiya, a rookie actress she found, she is striving to practice the new play “Garasha HOSOKAWA”. Because of troubles, Reika has a hesitation in acting. Kagami Izumi, professor of Folklore and author of play who is watching the practice, tries to rescue her the trouble by teaching acting technique. The cause of the trouble of Seika was that the withdrawing younger brother Kei entered emerging religion. Actually, Kei was forced to donate “Fucha-ro” the heritage of the parents who died in succession by the emerging religion “friends of the heart”. Akiko Tokuda who quit her post of prosecutor in Tokyo and recently started a lawyer in Kanazawa is a common friend of Saiko and Kaga0pl mi. It is decided that Akiko will ride in consultation of Reika at the dinner party where three people met again after a long time at “Taro” of hot-pot in Kazue-machi. Hostess of the restaurant is Tami, the relative of Kagami. A religious corporation “Friend of the Heart”, which aims to expand believers on the Hokuriku area based on Kanazawa, will happen to hold a party at Suikin-ro. Saiko heard it from the hostess, her mother, for a moment, she greeted customers with Akiko and orderers tailored to geisha. In the story with the banquet guests, it is understood that the Genius novelist of the premature death Seijiro Shimada who was from West-hanamachi was a childhood friend of grandmother of “Suikin-ro”‘s hostess and grandmother of Kagami Izumi. In the recollection, the self-taught genius Shima-kai gets scattered all over from the generation of the geisha Kikuno and the predecessor of Suikin-ro. The banquet was excitingly gorgeous with a shamisen of the hostess and songs and dances by Aiko, Akiko, Seika disguised as Geisha. The cuisine was the finest Kaga cuisine made by Takahashi, head cook of Fucha-ro dictating Kei and Kagami. Kei, who originally liked to cook, awakens to the charm of cooking, withdraws from religious groups, aims as a cook, decides to rebuild Fucha-ro with his older sister. Kei becomes an apprentice under Takahashi, Reika is in the apprenticeship of hostess, and the Suikin-ro is supposed to be the place of brother’s training aiming for the rebuilding of Fucha-ro. Following a clearer delusion, Saiko brilliantly played “Garasha Hosokawa” and bathed cheers from spectators of “Kageki-za”. It goes without saying that there were Kagami, Tami, Akiko, Kei, Takahashi among the spectators. 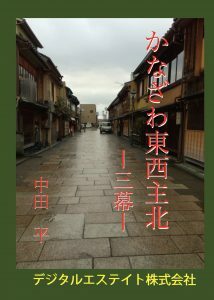 Please enjoy “Kanazawa-East, West, Shyu and North” in preview.